Growing Hot Peppers - The Spicy Side Of Gardening! 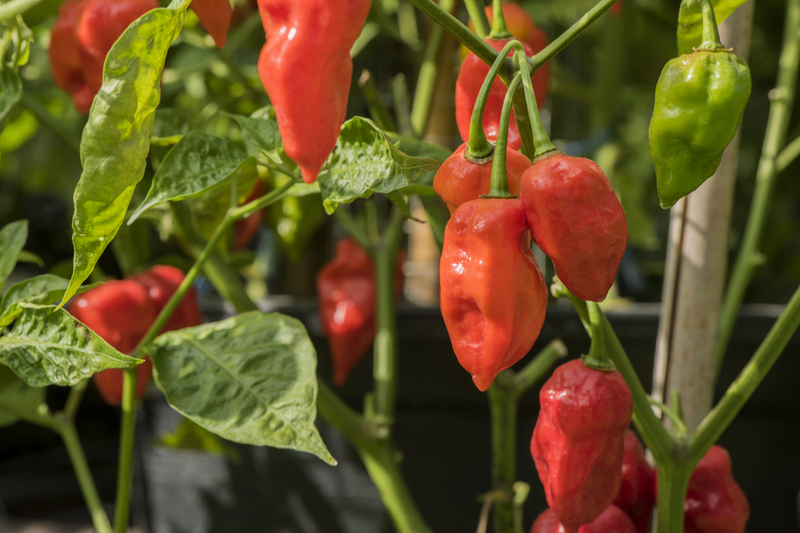 Growing hot peppers has become a passion for many gardeners. They can add plenty of heat to all types of dishes. Even more, they can add loads of color and interest to your garden as well. From mildly warm to near flame throwing hot, when it comes to growing hot peppers, the choices are almost overwhelming. No matter the variety, growing peppers successfully requires well-drained, fertile soil to achieve maximum yields. In addition, they need sun, and a lot of it! Peppers should receive a daily minimum of 6 to 8 hours of full sun. The more sun, the better the harvest. When growing peppers, it is also important to harvest on a regular schedule as they mature. If a plant becomes too overloaded, it will actually stop producing new flowers. Regular Watering Is A Must: Although peppers are one of the most drought tolerant of vegetables in the garden, regular watering ( on average, about 1/2 to 3/4 of a gallon per plant, per week) helps to increase yields. Giving peppers a little support can go along way too. Staking or caging helps to keep plants protected from heavy fruit loads. There is nothing more depressing than losing a big crop to a mid-summer storm. It also allows for better air circulation and sunlight exposure for ripening fruits. So how hot do you like it? The common way to measure the heat level in peppers is by using the Scoville system. The Scoville system is based upon heat units. The higher the units of heat – the hotter the pepper. Here is a look at a few popular hot peppers and their heat levels. Scotch Bonnet – The Scotch Bonnet is one seriously hot pepper! On the Scoville scale, it registers right up to a half million units. If you don’t think that is hot, understand a spicy jalapeno comes in at just 3000 units. The red, orange and yellow peppers hail from the Caribbean, and are named for their resemblance to a paper hat. Sante Fe Grande Hot Pepper – For those looking for a more tame hot pepper, the Sante Fe is a great choice. With a Scoville rating of 500 to 700 units, this pepper is a cross of heat and sweet. Plants grow to about 2 feet in height. They produce 3″ long, yellow to reddish-orange peppers. They are perfect for those looking to spice things up a bit without overloading taste buds with pure fire. Chinese Five Color : The Chinese Five Color is one of the most beautiful hot pepper varieties you can grow. Plants become filled with hundreds of 1 inch long peppers ranging from white, to lavender, orange, red and purple. The peppers form on 18″ to 24″ high plants that produce heavy loads right up to frost. They come in at somewhere between 15,000 and 30,000 on the Scoville scale. Jalapeno – Probably the most well know of the hot pepper family, the Jalapeno pepper is a wonderful addition to any garden. Its spicy flavor is perfect for heating up all kinds of dishes, soups and salsa. Plants are compact and heavy producers. The heavy fruit load should be supported with a small cage or stake to prevent late season toppling. Want to showcase your backyard garden on This Is My Garden? Perhaps you have a few tips on vegetable or flower gardening. How about becoming a contributing editor to This Is My Garden and share your story. Simply email us at info@thisismygarden.com, and your garden or garden tip might be our next feature! Cutting The Grass – 4 Mowing Mistakes To Avoid For A Better Lawn! June 6, 2018 TIMG Comments Off on Cutting The Grass – 4 Mowing Mistakes To Avoid For A Better Lawn! July 14, 2018 TIMG Comments Off on Saving Tomato Seeds – How To Save Heirloom Tomato Seeds For Next Year!